Revolutionize eyelash extension design with the ultimate application tweezer! Uniquely angled for precision pickup and attachment of multiple and single eyelash extensions, this versatile tweezer produces enhanced speed and accuracy when performing Volumation™ or Single-Layer eyelash extension applications. Features slip-resistant ceramic tips in white to improve visibility during the application process. Optimize the single or multiple (Volumation™) eyelash extension coating process with the Square Well Adhesive Tray. 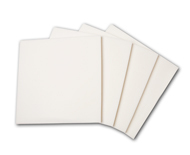 This ergonomi¬cally designed adhesive tray features 12 slanted square wells, allowing for a more comfortable and natural approach to coating, while maintaining adhesive performance. The square well design provides distinct corners, which assist with grouping multiple eyelash extension bases together, while the vertical wall helps prevent over-coating. These lint-free and latex-free professional cleansing sponges offer the quality, size, texture, and firmness that is essential for targeted and all-over cleansing of eye area and face. In addition to cleansing, these sponges can also be used to clean the nozzle of your adhesive bottle or during gel patch preparation. Its lint-free texture ensures that no fibers will be left behind on the face, gel patch or adhesive bottle. 1" x 1.5" x 0.25". Developed as part of the Xtreme Lashes® Faux Mink Lash Tray System, the Lash Grid sticker is the system’s fundamental organizational tool. Each grid represents an area for Faux Mink lash placement based on length and thickness, resulting in improved organization and faster lash pickup. Dimensions: 2” x 5”. Purchase the Faux Mink Starter Set to receive all the necessary system components, including a pack of Lash Grid stickers. Reengineered bottle for supreme performance and freshness! FlexFusion® Adhesive with Rapid Cure Technology™ is a hypoallergenic medical-grade eyelash extension adhesive, delivering a fusion of rapid curing (drying) speed, long-lasting adhesion, safety, flexibility, ideal viscosity and seamless connectivity. For optimal performance and longer-lasting adhesion, prep natural lashes with Xtreme Lashes Eyelash Primer prior to applying eyelash extensions. Insider Tips: *Basic makeup application and normal lifestyle can resume after the eyelash extension application. However, spray or airbrush tanning, exposure to excessive steam and heat, contact lenses insertion, and use of non Xtreme Lashes® cosmetics and skincare products should be avoided within the first 3 hours. Use the Xtreme Lashes Eyelash Primer during every full set and relash application. This essential product dis¬solves residual oils and optimizes natural eyelash pH, resulting in an ideal foundation for faster, more seamless, and longer-lasting attachment. This larger-sized microfiber brush is ideal for quickly dislodging small remnants of mascara or eye makeup from eyelashes. The lint-free brush tip coats eyelashes without the hindrance of cotton particles that can become lodged around the attachment area. Its absorbent tip holds liquids securely without dripping and also bends easily for greater control. 2mm tip. Isolate even the smallest of lashes with comfort and control. Uniquely shaped to extend over the contours of the eyebrows, eyes, and nose bridge, this ergonomically designed tweezer features precision tips that offer remarkable lash visibility and stability during isolation and separation. Its lightweight and evenly distributed tension produce enhanced accuracy and aim. 14cm in length. Will accommodate most hand sizes. Accuracy, always. Custom-molded fine point tips engineered specifically for precise eyelash extension pickup, coating and attachment. Its lightweight and balanced design effectively produces enhanced accuracy and speed. 14cm in length. Will accommodate most hand sizes. These dual-purpose gel patches effectively cover lower lashes, while nourishing the under eye area. Designed with Flex-Form technology, these gel patches repositions with ease, yet holds firmly in place on all eye shapes. Each patch contains antioxidant Vitamin E to protect the delicate under eye area and allantoin, aloe vera, and glycerin to condition and moisturize. Refresh and rejuvenate eyes instantly with an antioxidant-rich treatment for the under eyes. Formulated with hyaluronic acid to intensely hydrate and plump the skin to diminish the appearance of wrinkles, fine lines, and crow's feet. Also contains antioxidants Vitamin E and green tea plus allantoin, ginseng, aloe vera, and glycerin to condition, moisturize, and protect skin from damaging free radicals. Insider Tip: These gel patches are not lint-free. Additional prep is necessary for use in an application. Protect your massage table while creating a sanitary environment for your clients. These non-woven disposable massage table covers stretch to fit most standard tables up to 72” long and reduce the need for sheet changes in between appointments. Designed for one-time use, these lint free covers are fabricated from a very soft tissue for optimal client comfort. Newly developed to possess a larger brush head, these Disposable Lash Styling Wands are essential for demonstrating how to correctly apply Xtreme Lashes® Mascaras for gorgeous results. In addition to being ideal tester tools, Disposable Lash Styling Wands are also excellent for use throughout the Xtreme Lashes® Eyelash Extensions procedure. Single-use, sanitary and disposable, these brushes can be used to comb through lashes to keep them perfectly in place. Developed as part of the Xtreme Lashes® Faux Mink Lash Tray System, the Micro-spring Scissors are an essential tool for effortless cutting of Faux Mink lash segments. Possessing an ergonomic design and tweezer-like grip, this uniquely designed tool offers enhanced control and precise cutting. Made with high-quality stainless steel, this allows for prolonged use and easy sanitation. Purchase the Faux Mink Starter Set to receive all the necessary system components, including a pair of Micro-spring Scissors. Our Signature series tweezers are engineered for easy isolation and quick application. Formed from thick German steel, these longer 14cm curved tweezers are less angled than the 12cm version to better accommodate the natural finger curvature of longer fingers and larger hands. Medical Grade plastic tape should be placed along the edges of the gel patches to prevent lashes from sticking to the filaments of the gel patch. This tape is a hypo-allergenic surgical product exclusively supplied by Xtreme Lashes®. ®. This hypo-allergenic surgical product can be used to tape down the bottom lids during the procedure, keeping the bottom lashes from adhering to the top lashes. While we recommend using the gel patches (in lieu of tape) as the tape may cause irritation when removed, paper tape is an excellent substitute for those who may have skin sensitivity to the cosmetic ingredients and fragrances found in the gel patches. The original Application Sponge 4” x 6” (previously Aesthetic Sponges) provides a basic workspace for lash organization coupled with material flexibility and bounce for lash pick up. This foam ensures minimal pick up of fibers and filaments during the application process. Made from hypoallergenic, latex-free foam. With a denser texture and 50% larger than the Application sponge, the Xtreme Lashes® Lash Palette sponge is a key component for convenient and efficient lash pick up. At 6” x 6”, the Lash Palette offers a much larger work space and superior organization when using lashes of multiple lengths, curvatures, thicknesses, or color. Its lint-free surface minimizes tweezer snags while maintaining optimal flexibility, bounce, and ease of use. Latex-free. Great disposable pads for sanitizing your tools before the procedure. Manufactured of strong, flexible polyethylene (plastic), these 1oz medicine cups are the ideal table side vessels for all your application liquids. The translucent design displays graduated measurements in 1-8 drams; 1/8-1 fluid ounce; 1-2 tablespoons, 2.5-30 ml and 2.5-30 cc, allowing you to accurately determine how much liquid to start with and whether to add more throughout the procedure. Perfect for your Eyelash Primer, Xtreme Eye Makeup Remover and Eyewash Solution and 100% recyclable after use.